Another excellent move by Gianfranco Rizzardi: Italcraft too has come under his control. The rumours that had been going around all summer were officially confirmed at the beginning of September but the press conference - which dealt not so much with the methods and costs of the operation as with the advantages the purchase has brought to the Rizzardi Group - was rightly organized for the Genoa Boat Show, the major event of the Italian and European yachting season. The Italcraft brand, first of all, brings with it a shipyard that stands on 36.000 square metres, including 10.000 square metres of sheds, directly overlooking the sea in Gaeta. The yard represents a substantial implement for the production capacities and logistics of a Group which is already equipped with considerable structures. In fact the premises in Gaeta can be added to the traditional production unit in Sabaudia (60.000 square metres with about 11.000 square metres covered), the modern industrial plant in Cerasella (6.000 square metres of covered area which will soon be extended to 10.000), the shipyard in Fiumicino (2.000 square metres, today entirely dedicated to building the Technema 95'), the service structures of the Cantieri CNR in Ostia (11.000 square metres in the recently created marina, of which 2.200 are covered) and the premises of associated company Netter (again in Fiumicino, with another 3.600 square metres covered, 5.000 of yard area plus a dock and a river quay equipped for vessels up to 40 metres). In Rizzardi's words: The whole of Italcraft production will remain in Gaeta, but in order to fully exploit this new facility we shall certainly use it also for building the new Posillipo Technema 120', a superyacht designed by the architect Galeazzi. The first two have already been sold in Greece, one for the 2007 season and the other for 2008. Rizzardi continued: Italcraft, with its 50 years studded with epoch-making boats (from the Sarima, of which there are more than a thousand examples, to the Espada, from the X44 to the Drago and the M78 etc.) is undoubtedly an Italian name famous throughout the Mediterranean area. It's a brand with a decidedly hi-tech characterisation, quality vessels with high performances. This is a concept we aim to pursue absolutely in the coming years. So while the motoryachts produced under the Posillipo brand name will still be exclusively flying bridge and luxury superyachts and while Rizzardi will continue to build only classic opens, with the Italcraft brand name we shall be offering opens that are decidedly more sporty, with high performances and great technological content that go beyond the norm. Yachts like the Italcraft SSR 95, the new flagship we're showing here in Genoa. The Italcraft range will begin with the Sarima 38' and you'll soon be seeing two new boats, a 62' and a 68'. 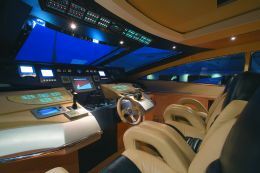 The SSR95, presented by its designer architect Gianluca Caputi, has a hull/transmission unit borrowed from military production, to be precise from a series of fast patrol vessels, Coastguard Class Corrubbia. There are already 20 examples and they use Arneson Drive ASD 16 Navy surface propellers. In Caputi's words: This is an indubitable guarantee not only of toughness and performance (more than 40 knots maximum speed with 2 x 2.775 HP MTU) but also of seaworthiness which is superior precisely because it is designed for such specific and hard use. 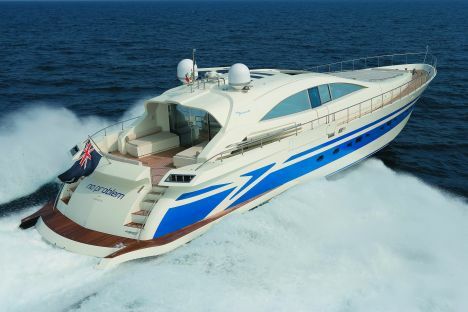 Sporty lines, bright interiors a spacious saloon, 4 cabins including owner's and VIP, all with bathroom. A relaxation room, a daytime bathroom on the main deck, central opening in the windshield, but also the use of floating floors, the best entertainment equipment etc. 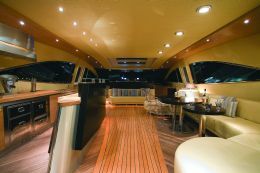 are some of the elements that highlight the yacht in greater detail. The Caputi family, who had owned Italcraft for about ten years, are still involved in the shipbuilding sector through Cantieri del Golfo, another traditional Gaeta yard which for some time however has been concentrating only on the military and merchant sectors.